While it’s tempting to dismiss meditations upon design as frippery, mere window dressing, it is in fact a powerful metaphor as to the confidence and competence of a motor business. For many years, BMW has been a carmaker who understood its brand and the semiotics of design better than just about anyone, which makes their latter-day retreat into banality even more mystifying. What the new 8-Series illustrates in the most eloquent fashion is that in today’s motor industry, heritage is for the birds. Furthermore, it underlines that within Harald Krüger’s boardroom, the plot has conclusively been lost. Fundamentally, not only are the car’s forms at odds with one another, they are a repudiation of over sixty years of BMW design history. At this point it might be germane to examine the nature of that heritage, such as it was. What we can say with some conviction is that without the Italian carrozzieri, BMW design would have not have evolved in the manner to which we have become accustomed. Two names did most of the heavy lifting to cement the BMW visual identity, Giovanni Micholetti and Giorgetto Giugiaro. Michelotti’s 700-series of 1959 established the familiar angular and upright glasshouse, something which he developed further as consultant to Wilhem Hofmiester for the 1962 Neue Klass series and its descendants. However, it was a neophyte Giugiaro at Bertone who perhaps did even more to codify the BMW aesthetic with the 3200 CS coupé of 1960, a car which also debuted the now definitive Hofmiester knick. Later, BMW employed the services of Gandini and Zagato’s Ercole Spada. Each brought something fresh, embellishing and enhancing without adulterating the formula – Spada’s work being particularly distinguished. More recently, Pininfarina under Fabio Fillipini offered a plausible and elegant route out the stylistic impasse in which they found themselves in their post-Bangle confusion. One to their eternal discredit, they chose to dismiss. A huge undistinguished lump of a car, the latest Achter sits rather uneasily, like a wobbly blancmange, dwarfing its massive wheels. Not only is it huge, it looks huge. It’s bad enough that it’s fulsomely adorned with all the visual noise – slashes, scoops and creases that stand in for actual design nowadays, but something far more profound has occurred. The 8-er also débuts the wholesale abandonment of BMW’s lineal form language. Search as you might for any hint of BMW design identity, and jewellery apart, you will do so in vain. From the unresolved DLO, with the barest squeak of Hofmeister, the weak stance, the flaccid proportions, to the unfortunate and curiously undefined rear haunch – instead of the tension and athleticism it was clearly intended to evoke, it simply appears limp. Make no mistake, even as a homage to Mustang, this is one poorly executed design. Global Product Manager for BMW, Sarah Lessmann told journalists at the car’s reveal last week the following. “The most important information is this: we have a sports car set-up.” It really does appear nowadays that the mere act of saying a thing makes it so. From this we can reliably ascertain that it will feature the requisite flatulent popping noises the market now demands from anything with Nordschlife pretensions. Now that it’s impossible to actually drive quickly, what matters is that one sounds as though one is, at all times. After all, is anybody interested anymore in what’s underneath? More depressing is the possibility the Achter could well be Munich’s last GT of this ilk, given the direction the industry is headed and how luxury manufacturers like BMW are working full-pelt to recalibrate exactly what constitutes a sporting vehicle. The grim likelihood is that its replacement will be some form of raised height fastback, all the better to sell to the preening narcissists who increasingly make up the market for these vehicles. In order to jettison one’s heritage, one must first discredit it. Having cast its hard-won reputation on the pyre – especially in light of senior management’s retreat over BMW i – the Bavarians now it seems are turning fire on the visuals. BMW are playing a dangerous game here. Their brand is strong, their image hitherto unassailable. In the right hands they are well placed to transition into the coming post-combustion landscape, but one cannot help feeling, perhaps for the first time, that in BMW’s current masters they are no longer in the right hands. I absolutely agree with what you wrote except for one minor thing: BMW’s confusion is not post-Bangle, it started with Bangle. BMW already had lost the plot when they started their full power assault on the “ugliest car in Europe” title and with Bangle’s help managed to get their whole model range into the top ten. As a then-critic of Bangle, I’m now a convert. Apart from the first iteration of his 7, the rest were worthwhile and striking cars. The design rot is post-Bangle with some exceptions. I have to second Richard here. What came as a shock at the time looks like s relief today. And not only because later designs are so poor. The BMWs from this period have aged rather well, and while I thought the E60 5-series was too massive then, it now turns out how well-made it is, also compared with the rather timid designs of the late nineties. I don’t wish to suggest that Bangle should be ranked alongside Picasso, but his work was in a similar vein. Picasso rewrote the rules of visual art because he understood them – he was a very accomplished painter in the classical style, before subverting what he had learned. Even his most radical paintings showed a true understanding of the centuries of tradition that preceded them. Bangle broke the rules too, but at least he understood those rules. His BMWs frequently appeared jarring and disjointed at first sight, but if you then saw his 5 series in your peripheral vision it suddenly seemed much more respectful towards its predecessors. As Eoin says here, the current designers at BMW do not seem to understand the legacy they have inherited. I’m terribly sorry but forcibly made to look at an E60 for any given time I still can’t see anything but a heavy looking example of clumsiness with grossly distorted kidneys, carnival light units and close to the most ham fisted shutline management ever. E60, E63 and E65 are worthy companions for cars like Durango 95 or Fairthorpe Tripper TX. The name that instantly springs to my mind as Bangle’s brother in spirit is certainly not Picasso’s, but Gorden Wagener’s. I’m with Dave on this one. Wholeheartedly. Anyone expecting anything but a bag of s*** was deluding themselves. The only”Bangle car” I can look at without wincing is the 1st one series especially in coupe form. At least any car produced under his watch however wasn’t entirely designed as a “premium” product. He had something to say. I hated what he said but at least he had the courage to push a new agenda. Since Bangle left all that matters is “does it look expensive” and “can we sell it by the truckload”. Surely the top of the range car is only going to display a square of these factors. ” We have a sports car set-up,” blurts Lessman. But what sport could that possibly be? Furzen maybe. The front owes too much to the Gran Lusso, which is one of few Pininfarinas I didn’t like, gross bullying really. The rear is not so much undefined as having a dozen definitions all tossed together, defying all attempts at seeing any clear meaning. And with the loss of the delicate glasshouses which used to define most BMWs, we’ve got one clunky vehicle. But it’ll be OK as long as it says: “I paid megabucks for this” — although, outside Germany, it’ll be on a finance deal which means you haven’t paid much for it, and will probably never own it outright. This is so depressing. Large coupés should be a gift for any designer, as issues of practicality can be subordinated to style and form, giving them maximum freedom to produce something beautiful and dynamic. Is this is really the best BMW can do? It’s a flaccid, overweight lump of a car with a tiny glasshouse and huge arse, covered in superfluous ornamentation in an attempt to disguise the underlying weakness of the design. Perhaps I’m missing something? Maybe this is designed to appeal to markets outside Europe where notions of style are quite different to ours? In any event, to my eyes BMW coupés have been on an accelerating downward spiral since the sublime elegance of the E9 CS. That’s a pretty good spot, in my book. It is indeed, except for the Panamerica=sized vehicles, which just look like vans with windows — and are they available only in black: I’ve never seen any other colour? I do wish they’d paid more attention to that design which Pininfarina came up with a few year’s ago. For me, the big issue is with the proportion of the turret relative to what lies below it, with the DLO highlighting the effect. It just doesn’t say ‘BMW’; it is, as you state, more Mustang like. The problem with the rear haunch is that it isn’t visually attached to anything, hence it looks instead like a potential weak point in the structure. And, as for the rear … what a mess. You’ve been cruel with your mini-picture show of previous sports coupés from the marque, some of which stop one in one’s tracks with their simple elegance, but I hope someone at BMW stumbles across this site and has a look, because from the looks of the latest 8 is might be the first time they have seen such a montage. I am not the only one who thinks the DLO is too small. The driver looks like a teenager. The car is simply far too big and heavy looking and it maybe because it is supposed to compete against the equally massive Bentley Continental. I have a theory that this trend for scalloped sides was started by the current Lancia Ypsilon. The Ferrari Scaglietti would be another contender. Coincidentally, a new car has been revealed today that is the absolute antithesis of this 8-Series. It’s functional, honest, rational and good looking. 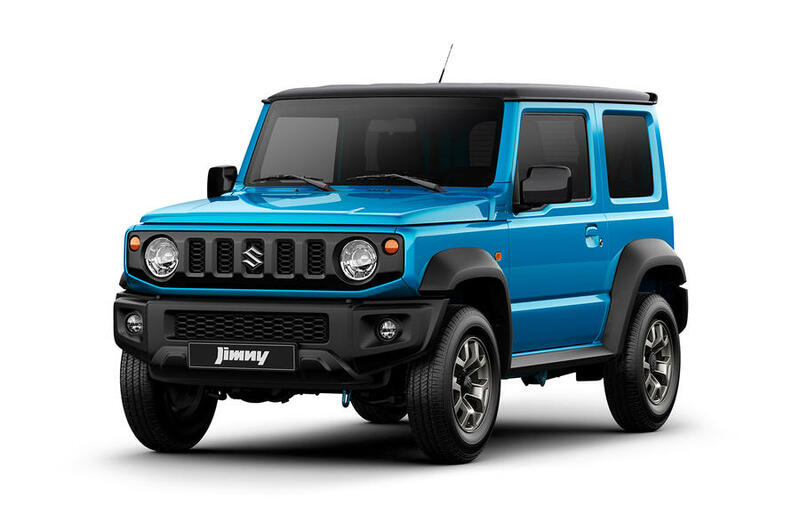 Welcome to the new Suzuki Jimny! Excellent. It’s straight out of the industrial design style guide. I do like that car: it will sell steadily in the Alpine areas from now until 2035. This looks great, almost as if they have reused the old SJ 410 body. I like that it has a more rugged look than the softish predecessor. I guess I will see a lot of them in the future. The E31 was mouthwatering, all without doing anything in particular. It was all down to proportion and detail. A masterclass in getting the basics right. With this one, they’ve stretched an M4. Lazily. Along the way, the kidney grills have been violated and the back has become a complete mess. Still, it’s hard to feel any sympathy for the fatcats who will buy it. Maybe BMW should poach that bloke from Hyundai – he seems to be doing a good job. The rear has too many elements. Overall this car is bloated. As I said, we’re in the Baroque era. Forgive my poor eyesight, but doesn’t that Jimny look like a Hummer H3 that has spent a little too long in the tumble dryer???…. It´s convergent evolution: dial up “robust” and “simple” and “engineered” as key words and this is what falls out. It is however much smaller. I see now what they did with the last Jimny: it is robust and cute. I still like it. These are great little vehicles. The Mitsubishi Pinin is a similar sort of thing. The BMW is a Pony car pastiche. That back end will certainly give powerful SUV drivers something to lock onto in the outside lane. And the new Jimny to my eye looks like a shrunken Gelander-wagen. Which is nice.